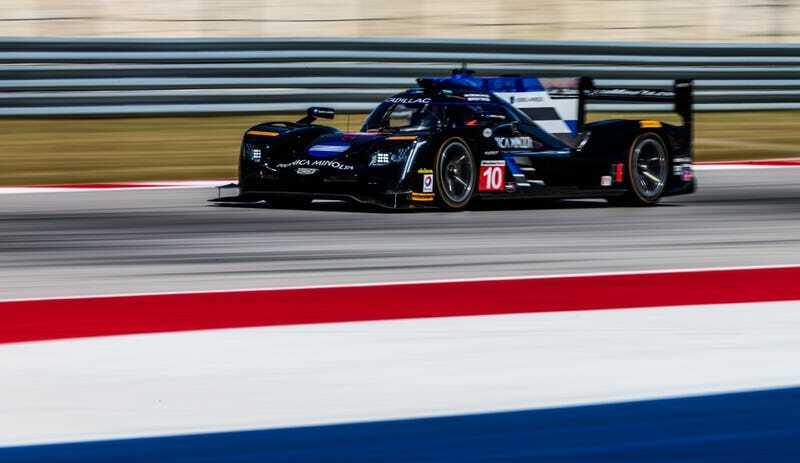 The same car that’s won all of the past three WeatherTech Sports Car Championship races this year is at it again. Here in Austin, Ricky Taylor just took the No. 10 Wayne Taylor Racing Cadillac DPi-V.R to a pole-grabbing lap of 1:54.809, 1.59 seconds faster than the next top Prototype-class car. That’s quick. Elsewhere, only three Prototype Challenge cars are here this weekend, and only one was faster than all of the GTLM-class cars: the No. 38 of Performance Tech Motorsports. The biggest surprise of the morning? BMW, in the same M6 GTLM that hasn’t been very fast, is is on pole in GTLM in their No. 24 car. The No. 62 Risi Competizione Ferrari 488 qualified in second place, but the other No. 25 BMW was right behind it. Did BMW finally figure out how to get more speed out of their M6? Another marque that had no shortage of complaints in its class last year also grabbed the GTD-class pole: a Porsche 911 GT3 R. Alegra Motorsports’ No. 28 Porsche will be starting in front there, right in front of the world’s only really interesting new Lexus, the No. 15 RCF GT3. Regardless of the mix of totally expected prototype results and rather unexpected GT results from qualifying, we’ve got two hours and 40 minutes of some good racing tomorrow. We’ll be here to take in all the madness. UPDATE: The No. 15 Lexus had a ground clearance issue that failed post-qualifying tech inspection, so they will start from the back instead of from second in GTD. Full results can be found here.